Malachi 4:6 promised that fathers and children would be reunited in heart. Let's make that true in our homes by nurturing and correcting our children — with a balance between nurture and correction. Let's not make our faith so full of rules and restrictions that it becomes impossible for our children to hear that they are our beloved children, with whom we are very pleased! Let's not grant so much freedom that our children feel neglected and uncertain. Let's turn our hearts toward them and pray for God to turn their hearts toward their home with us and their home with you! O Lord God Almighty, Abba Father, our land lies under a curse because so many Fathers have spiritually and physically abandoned their children. 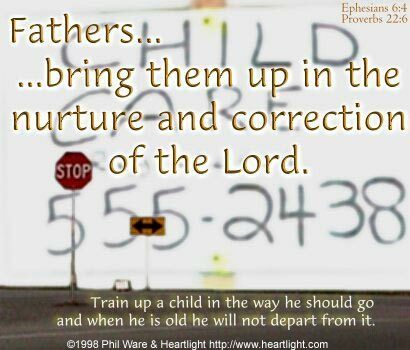 Please raise up parents, especially fathers, who will balance the challenging tasks of love, nurture, and correction so that our land may be healed and our children may know your love and grace. In Jesus name. Amen.